What is the one thing customers want from your social media in Melbourne, Florida? Coupons! Everyone these days is looking for a great deal. Facebook has created an easy-to-use feature that allows your business to create an offer and share it with your customers. By giving Facebook Fans exclusive offers and coupons, they will be more than happy to use them. A simple ‘Buy One, Get One Free’ offer or even ‘15% off your next purchase’ will excite these frugal finders and drive up your sales. Fans of your page can share the offers with their friends to create a buzz about the great deal your offering. Welcome To Our New Social Media Intern! Black Tie Digital Marketing is excited to welcome our newest member of the team, Kristen Sibbitt, our new Social Media Intern. Kristen is a senior at Florida State University, and is studying Marketing. Kristen enjoys reading in her free time, and was the editor of her school newspaper. Scott and I have an incredible opportunity to drive to Atlanta for a SEO and SEM seminar presented by Google. Google will be speaking to internet marketers and businesses about how to make the most of Google’s product’s, Adwords and Analytics. Converting visitors into leads by Black Tie Digital Marketing CEO, Scott Brazdo. Scott talks about the importance of converting visitors into leads for your digital marketing strategy for your business. Does Advertising In The Yellow Pages Still Work? Does advertising in the yellow pages still work? The yellow pages are dead or dying, and everyone knows it. When was the last time you even allowed one in your house? Most of us (if we still even receive them), open the garage door, crack open the trash can and in it goes. (The more environmentally responsible of you, probably recycle) But you know what I’m getting at. Just a few short years ago, a small or local business could count on the yellow pages to make their phones ring as reliably as rain in Florida. It just happened. Well, its a drought now and its never going to rain for printed yellow pages ever again. So lets move on. The Internet is the new yellow pages and GREAT NEWS, it’s an even playing field. Your Business Rocks and Your Web Presence Should Too! I have the pleasure of getting to meet with local business owners every single day. 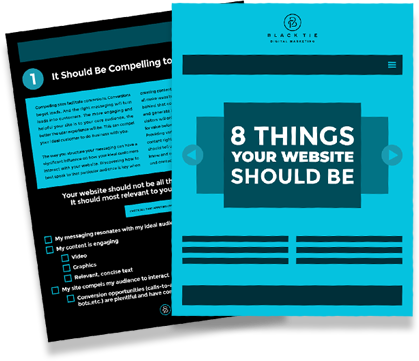 The most common question I ask an owner as soon as I meet them is, “Does your website make you money?” Sadly, in my years of digital marketing, I have never heard a “Yes” in reply. This is a great illustration that explains social media down to a T. My favorite is the Google+ quote, LOL a total classic! Melbourne Florida Web Design will never be the same! Black Tie Digital Marketing is finally here! Melbourne Florida Web Design will never be the same. We are so honored to be serving all of Central Florida and helping small businesses grow each and every day utilizing a KILLER web presence! Melbourne Florida based Web Design, Digital Marketing, SEO, Social Media, and more! We may be based in small-town Melbourne Florida, but we’re a national brand. We have clients that span North America, and are quickly expanding into new regions and businesses. Call us today at 1.800.316.8030 to find out how we can help you grow your business! We are all about helping you make more money, period. If you are independently wealthy, and don’t need to make any more money in your business, STOP reading here. For the rest of you, this may be just what you’ve been looking for.